LEGO fans of all ages have been waiting in sweet anticipation for the latest LEGO Movie, ‘LEGO Movie 2: The Second Part’, featuring a whole cast of new villains including Queen Watevra Wa’Nabi (Tiffany Haddish) and General Sweet Mayhem (Stephanie Beatriz). In anticipation for the film, Mbadika premiered their first BNN Episode of their latest series, mLab, on BNN - Comcast Channel 9 I RCN 15 I Verizon 1961 I Streaming bnnmedia.org - in order to showcase how using STEM (Science Technology Engineering Mathematics) you can bring your LEGO Movie inspired ideas to reality. 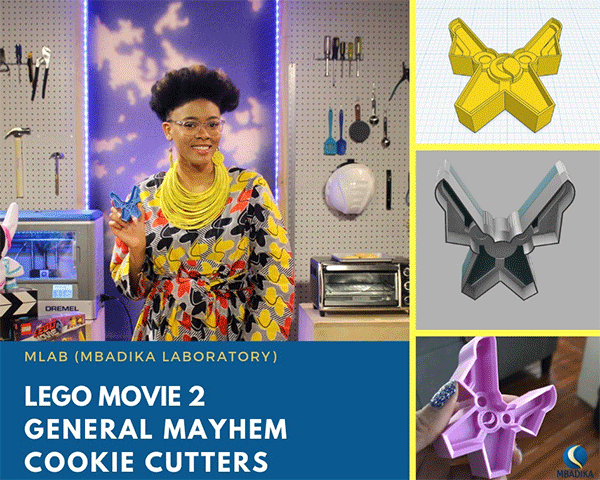 In this Episode, Mbadika’s Executive Director and mLab Host, Netia McCray walks viewers step by step through how she created Cookie Cutter inspired by the villain, General Mayhem, from the LEGO Movie 2 using a 3D Printer in order to create General Mayhem Cookies. In addition, mLab takes a Field Trip to the Hawthorne Youth and Community Center (HYCC) to explore a mLab Workshop in action at local maker-space and computer lab. After the Episode, viewers will be encouraged to create their own version of a Cookie Cutter following Mbadika’s online Step-by-Step Tutorial. As a STEM-focused organization, Mbadika wants to encourage students to take their first steps and/or continue exploring STEM. Hence, in celebration of the Premiere, Mbadika has partnered with Haley House and TSN (Timothy Smith Network) to bake and distribute General Mayhem Shortbread Cookies to over 250 LEGO Robotics participants throughout Roxbury using the project highlighted in this mLab Episode to showcase the possibilities of a career in STEM. We hope you can tune in as we move one step closer to making sure...*deep breath*..."Everything is Awesome".